Abstract for news about chemistry – The kinetics and mechanism of ruthenium(III) catalyzed oxidation of isobutyl alcohol(IBA) by cerium(IV) in sulfuric acid media has been investigated by titrimetric technique of redox in the temperature range of 298-313K. It is found that the reaction is first-order with respect to Ce(IV) and Ru(III), and a positive fractional order with respect to IBA. It is found that the pseudo first-order ([IBA]>>[Ce(IV)]>>[Ru(III)]) rate constant kobs increases with the increase of [H+] but decreases with the increase of [HSO4–]. Under the protection of nitrogen, the reaction system can not initiate polymerization of acrylonitrile, indicating generation of free radicals. On the basis of the experimental results, a suitable mechanism has been proposed. The rate constants of the rate determining step together with the activation parameters were evaluated. Transition metals in a higher oxidation state generally can be stabilized by chelation with suitable complex agent. Metal complexes such as silver (III), copper(III)and Ce(IV) ions are good oxidants in a medium with an appropriate condition. However, our preliminary observations indicate that oxidation of some organic compounds by Ce(IV) in aqueous sulfuric acid is kinetically sluggish, the process can be efficiently catalyzed by various metal ions even at trace concentration. Different metal ion catalysts like chromium(III), ruthenium(III), iridium(III) etc. have been used in the oxidation by cerium(IV). Among the different metal ions, ruthenium(III) and iridium(III) are highly efficient. In the modern chemical industry, the higher requirement on catalyst selectivity has been advanced. However, the studies of active center structure by means of physical method can not calculate reaction pathways about complicated molecules. Reaction mechanism of various elementary reactions must be investigated to analyze the factors of affecting the selectivity. Therefore, the basic study of catalytic reaction will provide the scientific basis for improving catalyst selectivity and making high-efficiency catalyst. Now the lack of studying on the Ce(IV) oxidation of IBA stimulated us to explore the kinetic behavior of the title reaction in order to continue our studying on metal ion catalysis in cerium(IV) oxidation reactions. Ceric sulfate (Ce(SO4)2), ferrous ammonium sulfate (Fe(NH4)2(SO4)2), isobutyl alcohol(IBA) and ruthenium trichloride (RuCl3) were of A.R. grade. Doubly distilled water was employed throughout the experiment. Ceric sulfate solution was prepared by dissolving it in sulfuric acid and standardized with ferrous ammonium sulfate using ferroin as an indicator. IBA was purified by distillation and its concentration was obtained from its density measurements. Stock solution of RuCl3 was prepared by dissolving RuCl3 in warm 1.0 mol·dm-3 H2SO4 solution and kept for several days at about 40oC to attain the equilibrium. The concentration of Ru(III) in the stock solution was determined by spectrophotometry. The ionic strength (m) was maintained by adding NaNO3 solution. Under the condition of [IBA]>>[Ce(IV)]>>[Ru(III)], 25mL of solution containing definite [Ce(IV)], [Ru(III)], [H2SO4] and [NaNO3], and 25mL of IBA solution of appropriate concentration were transferred separately to the upper and lower branch tubes of l type two-cell reactor. After it was thermally equilibrated in a thermostat (about five minutes), the solutions were thoroughly mixed. The progress of the reaction was monitored by withdrawing aliquot of the reaction mixture at regular intervals, adding it into excess standard Fe(NH4)2(SO4)2 sulfate solution in sulfuric acid to quench the reaction, then back-titrating the unreacted iron(II) by standard cerium(IV) solution using ferroin as indicator. The pseudo first-order rate constants kobs were evaluated (Figure 1) from the slope of the plots of ln[Ce(IV)]t versus time (t) i.e. 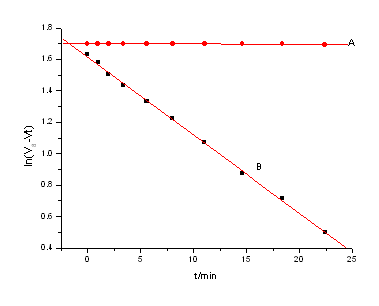 ln((V∞-Vt) versus t where V∞ and Vt denote the volume of standard cerium (IV) solution needed in back titration for the unconsumed iron(II) solution at infinity and time(t) respectively. To evaluate kobs, generally 8-10 values at least up to 80% completion of the reaction were used. Average values of at least two independent determinations of kobs were taken for analysis. The observed rate constants were reproducible within the experimental error±5%. Under the condition [IBA]>>[Ce(IV)]>>[Ru(III)], the plot of ln (V∞-Vt) versus t was linear(Fig.1), indicating that the reaction is first-order with respect to [Ce(IV)]. The pseudo first-order rate constants kobs are independent upon the initial concentration of cerium (IV) in the 1.0~ 3.0×10-3mol·dm-3 range. At fixed [Ce(IV)], [Ru(III)], [H2SO4], ionic strength (m) and temperature (T), kobs increases with the increase of [IBA]. The plot of kobs vs. [IBA] was a smooth curve, indicating fractional order in [IBA] ,observed reaction order nap= 0.61（r=0.9988）. The plot of 1/kobs vs. 1/[IBA] exhibits excellent linearity (Fig.2) with a positive intercept and slope. [H+] was varied over the range 0.2~1.0 mol·dm-3 at fixed [HSO4–] ([HSO4–] = 1.0 mol·dm-3≈[H2SO4]+[NaHSO4]), [IBA] and [Ru(III)], [H+] was calculated ignoring the dissociation of [HSO4–] and assuming [H+]≈[H2SO4](Table 2). [Ce(IV)]=2.5×10-3mol·dm-3; [Ru(III)]=1×10-7mol·dm-3; [IBA]=0.1mol·dm-3; I=1.0mol·dm-3; t=30oC; a(intercept), b(slope) and r (correlation coefficient) for the linear regression of kobs vs.H+. The completion of the reaction was marked by the complete fading of Ce(IV) color (yellow). One of the reaction products as isobutyl aldehyde was detected by spot test and estimated, Another product Ce(III) was also detected by spot test. Acrylonitrile solution(40%,V/V) was added to the reaction mixture under the protection of nitrogen gas, no white deposition could be found, indicating the reaction system can not initiate polymerization of acrylonitrile and proving free radicals is not formation in the reaction. Subscripts T and e means total and equilibrium concentratration respectively. This research was supported by National Science Foundation of China (No. 20675024), Natural Science Foundation of Hebei Educational Committee (No. 2006407；No. 2008307), China Postdoctoral Science Foundation (No. 2005037629) and Science Foundation of Hebei University. SONG Wen-Yu, LI Wen-Kui, JIA Chun-Ping. Chemical Journal of Chinese Universities, 1999, 20(11): 1767-1771. SONG Wen-Yu , LIU Hong-Mei. Journal of Inorganic Chemistry, 2000, 16(4): 607-611. Lakshmi S, Renganathan. Int. J. Chem. Kinet., 1996, 28(10): 713-720. SONG Wen- Yu, JIANG Qing-Mei. Acta Chimica Sinica, 2005, 63(2):109-113. Das AK, Das MK Int. J. Chem. Kinet, 1995, 27(1): 7-16. [ 6] Das AK, DAS M. Indian J. Chem . , 1995, 34A : 866-870. KONG Fan-zhi., TIAN Jian-hua., JIN Zi-lin. Petrochemical Technology, 2002, 31( 5): 387~392. Feigl F. Spot test in organic analysis. New York: Elsevier pulishing Co., 1956. P334. Department of Chemistry, Hangzhou University. Handbook of Analytical Chemistry. Beijing: Chemical Industry Press, 1982. Moore J. W., Pearson R. G. Kinetics and Mechanism. New York: John Willey and Sons, 1981. P379.